I enjoyed being out of school for the holiday today. Although Tom had to go into work, we still made time for a family game "late afternoon" with Monopoly. We love the new electronic banking version. Kevin thought it was a "hair-raising" experience! 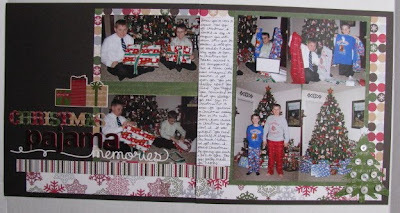 I also worked in some time to scrap today and made three layouts last night after the boys went to bed. Since I didn't have to get up early for school, I stayed up late. Really late! My recent photo order contained several Christmas photos and I decided it was finally time to use my "Merry Christmas" paper collection by Echo Park. I had purchased this as soon as it was released, but saved it to use with this years' photos. 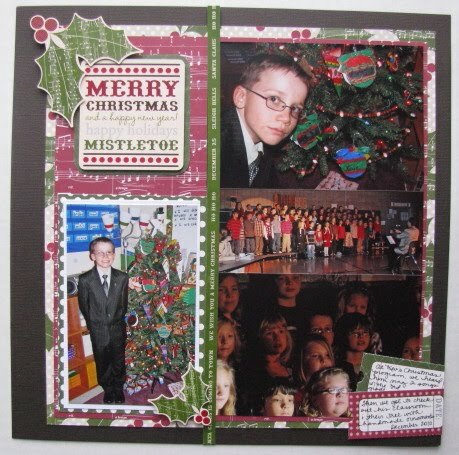 For the first layout, "Ready for Christmas Mass," I used a silvery shade of Bazzil bling cardstock. The boys' expressions were so fun in these photos that I had to scrap them all. 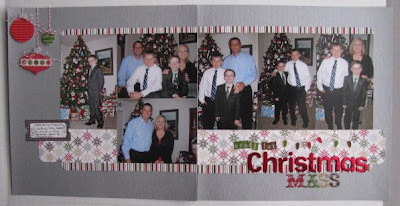 To accent my page, I used the ornament stickers from the 12x12 sheet and adhered them with pop dots. I added baker's twine to make them look like they were hanging. 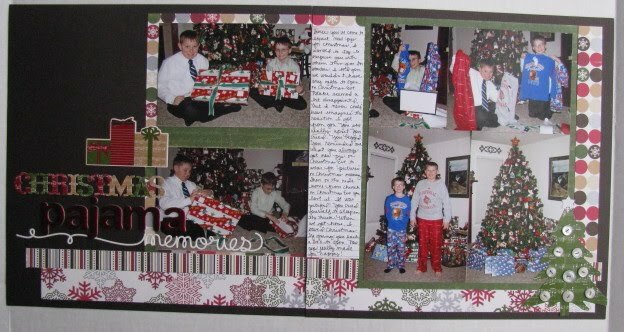 The dark brown background I used for "Christmas Pajama Memories" didn't photograph too well today. It stayed overcast. I am really happy with how it looks in person though. I was inspired by Allison Davis' 2-page Sketch #7 at Sketch Support. I added a word sticker by KI Memories and foil Thickers for my title. When I thought I was finished with the layout, I realized it was still missing "something" so I added the buttons to the tree. Of course, I had to tie them on! Then I switched gears to scrap a few single-page layouts. First up was Kevin's Christmas program at school this year. I liked the "Merry Christmas" sticker so much that I used it in place of a title on the page. I used pop dots on the sticker embellishments. 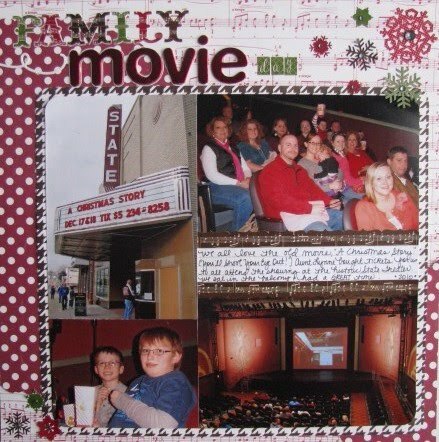 One of my favorite Christmas activities was the family outing (16 of us!) to see "A Christmas Story" at a local historic movie theater. I added bling to the centers of the snowflake stickers. Finally, I completed a layout showcasing the tree in Kevin's room. He decorated it all by himself. I love seeing the handmade ornaments from each year. Several items from my stash were added to this page (Jenni Bowlin large star covered in Stickles, Jenni Bowlin mini bingo card, random vellum tag, baker's twine, button, bling brad). I also sprayed the page with Pearl Glimmer Mist. Electronic banking in monopoly? Didn't know that was available. Cool! Awesome LO's! I LOVE the bakers twine with the dimensional ornaments! SO cute! 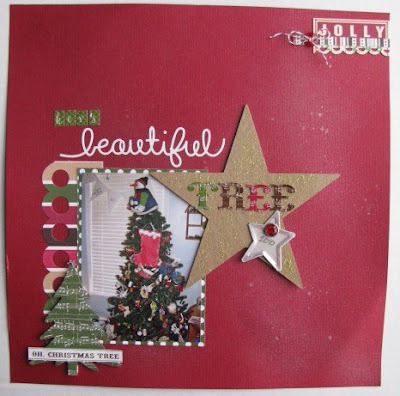 Lovely Christmas layout Amy....you are so quick with getting your layouts done. Adorable pages, Amy! Looks like it was a memorable December! I love those layouts! I am inspired to go scrap my Christmas pics for this year. Wow I love these layouts. This paper is fabulous!